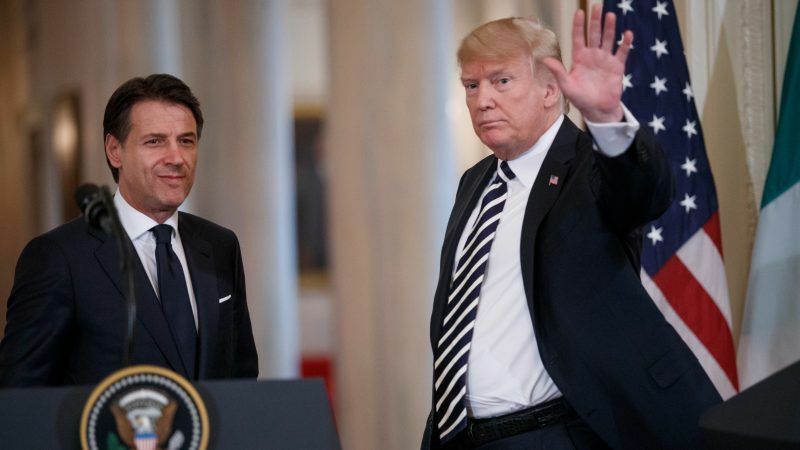 US President Donald Trump traded smiles, handshakes and compliments with Italy’s populist leader Giuseppe Conte Monday (30 July), as the two rightists presented a united front on everything from Russia to immigration. Trump welcomed the novice prime minister to the White House with outstretched arms, hailing him as a kindred spirit — a fellow political outsider with an admirably tough line on immigration. “We got along very well right from the beginning,” said Trump, lavishing praise on the 53-year-old Conte. After years of Italy living in the political shadow of its larger European neighbors, Conte seized on a White House visit to boost his country’s profile — and his own. Describing the “special invitation” from Trump as a great tribute to Italy and himself, Conte said Rome now wanted to become a “privileged interlocutor” of the United States. In return, the Italian leader seemed ready and eager to provide political cover for Trump, who is struggling to smother multiple crises at home ahead of crunch November mid-term elections. A recent Economist/YouGov poll showed a scant 40% of American voters approve of how Trump handles foreign policy. The controversial 72-year-old Trump has been pilloried by Democrats and Republicans alike for his cozy relationship with Russian strongman Vladimir Putin and his rows with allies at recent summits. 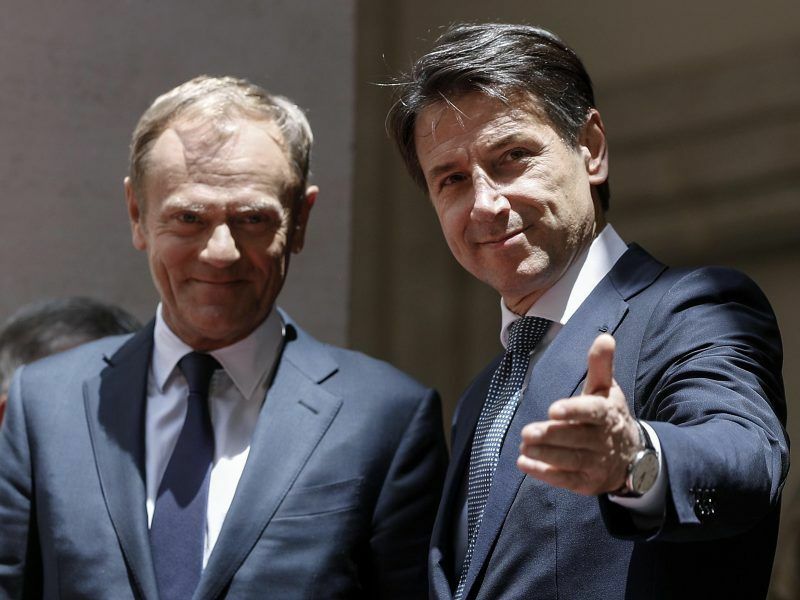 Italian Prime Minister Giuseppe Conte said yesterday (27 June) the renewal of EUuropean Union economic sanctions against Russia should not be automatic, as Rome seeks to resume EU funding to small Russian firms to ease tensions with Moscow. The visit began with a handshake and a smile from Conte at the West Wing portico. The two leaders then held a one-on-one Oval Office meeting and more extensive bilateral discussions before facing the media. Trump — who has pursued a “zero tolerance” policy at the US border, a crackdown that led to hundreds of children being separated from parents who crossed into the country from Mexico without papers — praised Conte’s approach on the issue. “I agree very much (with) what you’re doing with respect to migration and illegal immigration, and even legal immigration,” Trump said, encouraging other European countries to follow suit. Conte was chosen to lead the Italian government by the leaders of parties that won elections in March: the eurosceptic 5-Star Movement and the far-right League party. The Italian press has suggested the White House meeting will boost Conte, who is often overshadowed by his deputy prime ministers, who are also those parties’ exuberant leaders: Matteo Salvini of the League party, and Luigi Di Maio of the Five Star Movement. Salvini stole some of the attention on the eve of the White House meeting by posting a controversial message on Facebook — “many enemies, much honor” — that echoed a well-known saying by Fascist dictator Benito Mussolini on the anniversary of the latter’s birthday. Conte won Trump’s support for his effort to reform European Union migration rules and the apparent establishment of a joint monitoring center in the Mediterranean. Italy argues that the bloc’s current law places an unfair burden on countries that border the sea, and its new populist government has stepped up pressure on other EU countries to share responsibility. It has closed Italy’s ports to migrants and turned back several ships carrying refugees rescued at sea, threatening the future of those operations. Both Trump and Conte also favor better relations with Russia, although Trump had one eye on domestic opinion when he insisted sanctions would stay “as is” for now. According to Nick Ottens of the Atlantic Council, Trump “may not find the ally he expects” in Conte. On trade, the new Italian government’s scepticism of multinational agreements could complicate Trump’s desire to see all EU tariffs eliminated, according to Ottens. 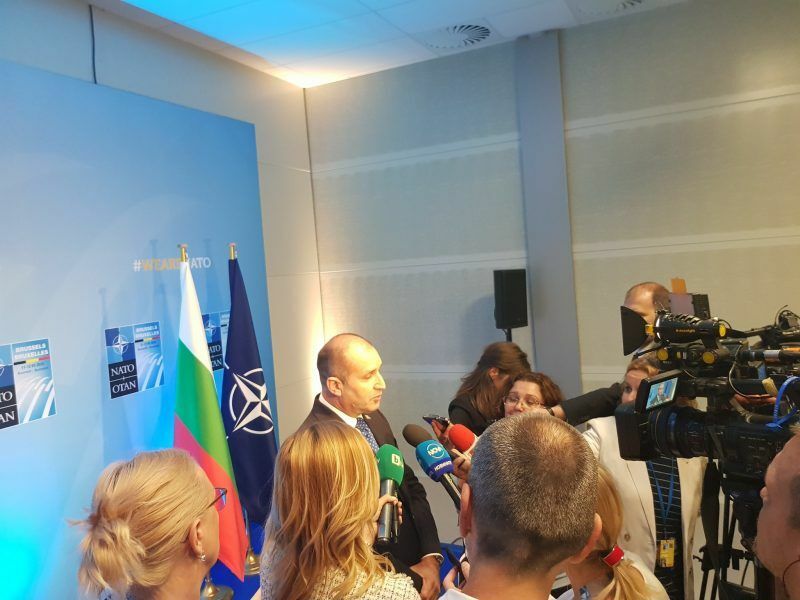 Meanwhile, in the defence realm, Italy has said it has no chance of reaching the target spending of two percent of GDP — let alone Trump’s stated goal at the latest NATO summit of four percent. In early July, Italy’s defence minister Elisabetta Trenta announced a freeze on purchasing F-35 fighter aircraft, of which the US is the primary contractor. The pair also brushed over differences over Iran, where sanctions have hurt Italian-Iranian commercial relations. Trump said he was willing to meet Iran’s leaders without preconditions but did not say what Tehran had to do to have sanctions lifted. Praising Conte for his bold leadership is very premature. Ask who opened the barn door? Not exactly a populist front. There is much that separates them. Trump is just grabbing an opportunity to appear having an ally. It will come to grief soon enough.